For sale/trade my 2011 Harley Davidson XL 1200 Low. 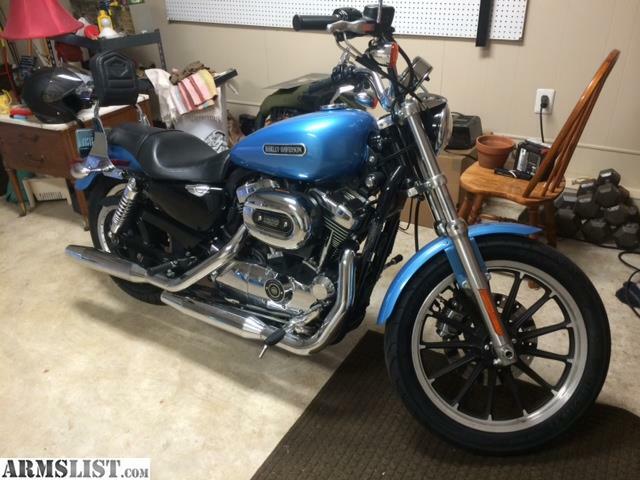 Forward controls, sissy bar, saddleman seat progressive shocks rear, progressive cartridges front, michelin tires. Always garaged 5500 miles. Ridden by older rider. The price is the cash price. Please don't expect cash price when trading. (Blue Book 6100.00) Will take partial trade for: Colt Python, Colt SAA, Colt revolvers, Colt 1911 older (pre-64) Winchester rifles and shotguns, high end O/U or S/S shotguns; Wilson 1911; also kevlar canoe/kayak; MEC reloading equipment 12 gauge 9000; high end knives: Randall Lile; M1 Garand; Browning 9mm; will consider other high-end firearms. Colt Python, Colt SAA, Colt Revolvers, Colt 1911, (pre-64) Winchester rifles and shotguns, high end (O/U or S/S shotguns; Wilson 1911; kevlar canoe/kayak; Mec 9000 reloader 12 gauge; Lile, Randall knives (some other high end knives); M1 Garand; Browning 9mm; will consider other high-end firearms.